AIRASIA Bhd is flying into critical times as it attempts to execute several digitalisation initiatives unveiled last week, aimed at monetising its data and boosting its ancillary revenue by becoming an “Amazon in the sky”. In the coming months, the low-cost carrier (LCC) seeks to roll out an e-wallet service for Southeast Asian travellers, refine an in-flight digital purchasing system to remove cash and merchandise trolleys and rebrand its online duty-free store to include home delivery services. The duty-free store, which will be called ROKKI, will also leverage AirAsia’s growing data trove for more targeted marketing of its products. The airline is already testing dynamic pricing of checked-in baggage charges and will use machine-learning to better understand what flyers are willing to pay. “It’s basically Amazon in the sky, but it can continue when you land,” says group CEO Tan Sri Tony Fernandes after presenting the digitalisation strategies in Singapore. Another initiative hinges on AirAsia’s content platform travel 3Sixty°, which, he says, will be revamped to become the “Snapchat of TripAdvisor” in Southeast Asia. It aims to use traveller-generated photos to showcase destinations around Asean. “Forget words. Pictures are going to be more relevant because we all come from 10 different countries [in Asean] with different languages,” says Fernandes. When asked about the potential impact on earnings, he declines to specify a figure. The impact, he says, will depend on the execution and the support from its partners, particularly airports. As a benchmark, he reiterates a previously stated target of RM60 ancillary revenue per passenger that AirAsia is pushing for. If all goes according to plan, he says “RM60 could look very small in the scheme of things”. Last year, AirAsia recorded RM48 in ancillary income per passenger. In the second quarter ended June 30, 2017 (2QFY2017), it chalked up RM49 per passenger. The latest announcements are a culmination of AirAsia’s long-term push to monetise its data and boost its ancillary income. As far back as 2012, the group had said it wanted to mine its huge database of flyers in a more systematic manner so as to be more targeted in marketing its ancillary products and services. And the data trove is sizeable — the LCC is Asia’s largest in terms of passengers carried. Last year, it flew 56.6 million passengers and is expecting a 29% increase this year to 73 million. AirAsia has spent the past few years mining its data to make it “useable” as well as fine-tuning its data collection, says Fernandes. If successful, the initiatives may accelerate its ancillary income growth, which had largely been boosted by passenger volume increases in recent years. “It’s all about implementation now. If we don’t implement [these initiatives] well, then we’re going to be around where we are now [in terms of ancillary revenue],” says Fernandes. In FY2016, AirAsia’s ancillary revenue amounted to RM1.26 billion or 18.4% of total group turnover. The biggest contributor to this segment was baggage fees (45%), followed by cargo (10%). Another 19% came from food and beverage, seat selection and travel insurance. Its cumulative 1H2017 ancillary revenue totals RM926 million or nearly three-quarter of the full-year figure in 2016. At the current pace, the airline is on course to grow its ancillary revenue by roughly 46% for FY2017. That said, AirAsia’s ancillary revenue proportion of turnover remains some distance below its peers’ globally. According to the latest annual ranking of ancillary revenue proportion for airlines by US consultancy IdeaWorksCompany, AirAsia came in 13th out of 66 airlines reviewed. In the latest report released in September, the consultancy reviewed 138 airlines and found that 66 disclosed financial details of their ancillary products and services. When it started the annual ranking in 2007, there were only 23 airlines that disclosed the information, it said. It must be noted that the ancillary revenue basket is unique to each airline. 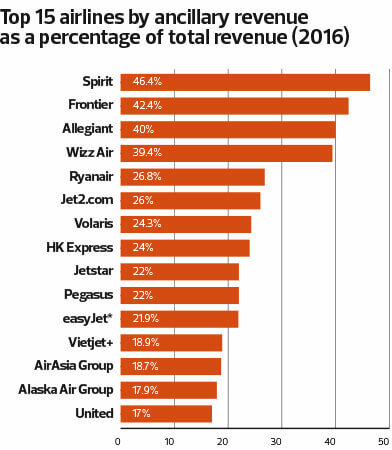 Topping the list is Florida-based LCC Spirit Airlines, which derives 46.4% of its revenue from the ancillary segment. US carriers Frontier Airlines and Allegiant Airlines also reported that more than 40% of their revenue came from ancillary sources. This year, AirAsia is expected to hit RM9 billion in revenue and RM1.51 billion in net profit, according to the median estimate from 24 analysts polled by Bloomberg. In FY2016, it recorded RM6.85 billion in revenue, up 8.7% year on year, while net profit amounted to RM2.11 billion, jumping nearly four times y-o-y due to foreign exchange gains and turnaround in some associates. Getting the technological aspect right is the biggest challenge for AirAsia’s digitalisation push, says Fernandes. For the e-wallet service, for example, it is partnering data security firm Finexus Cards Sdn Bhd. He says the data-driven personalisation is already helping the airline improve sales. Citing food and beverage as an example, he says AirAsia is beginning to stock the right types of food on aircraft, based on data of what passengers prefer. On the airport front, the duty-free shopping push may face resistance, given the existing relationships between operators and duty-free tenants, who may see ROKKI as a threat to their business. But Fernandes hopes to change their minds. He says the target market would be passengers who did not buy duty-free products and services to begin with when passing through the airports. 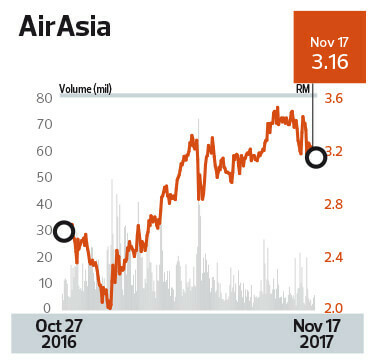 “When we started the airline, we didn’t take away passengers, but grew the market,” he says, adding that AirAsia is similarly “trying to grow the wallet” by targeting the non-buying segment. Citing Star Trek, Fernandes feels the LCC is going “where no man has gone before in Asia”.